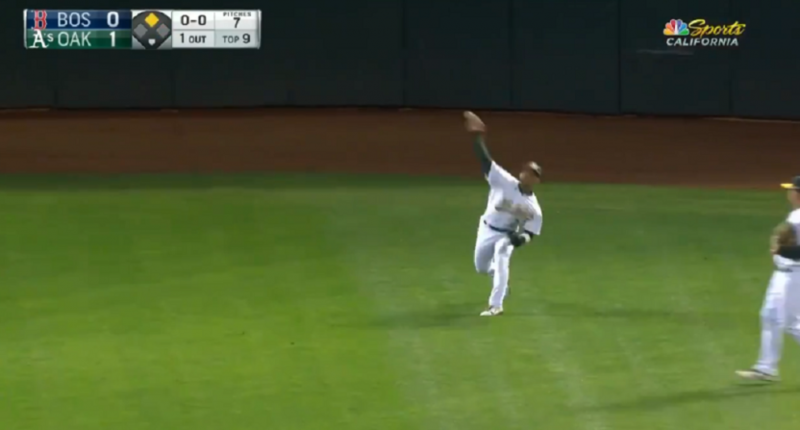 Oakland A’s center fielder Ramón Laureano showed off a ridiculous throwing arm in his rookie 2018 season and had nine assists in just 47 games. Well, it hasn’t taken long in 2019 for Laureano to show off his cannon and make game-changing throws. On Monday night, Laureano threw a 96-mph strike to nail the Boston Red Sox’s Xander Bogaerts at the plate. At some point, you’d have to think that the league would stop challenging Laureano’s arm. Then again, it seems Bogaerts didn’t learn his lesson from the night before, so maybe not. Laureano’s defense has played a big part in the A’s (5-3) winning four straight games and shutting out the defending champion Red Sox on consecutive nights.